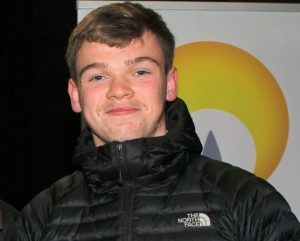 CONGRATULATIONS to local canoeist Ronan Foley got two awards at the recent inaugural Canoeing Ireland National Awards at the Spa Hotel in Lucan. Ronan’s awards were in the Junior Canoe Marathon and Canoe Sprint categories. Young canoeists were prominent in the awards, which were spread over a range of disciplines, including Freestyle, Marathon, Polo, Slalom, Sprint, Surf and Whitewater. There were also awards for Community Impact, Event of the Year, Team of the Year and Volunteer of the Year. Ronan was was presented with a Kilcullen Community Award last November for his achievements in winning gold and silver medals in European and world events last year, the latest in a growing tally of high level competition results.